Posts Tagged with: "Ayala Land"
Ayala Land recently opened Vermosa Sports Hub, the country’s first premier and professionally managed sports facility, located at Vermosa, Daang Hari Road cor. Vermosa Blvd. in Imus, Cavite. It is situated within the 700 hectares of space in Vermosa, a masterplanned mixed-use estate of Ayala Land. + the Philippines’ first 9-lane track oval built in accordance with the International Association of Athletics Federations (IAAF) standards. Fee: P90 for 6 hour use. + Olympic-size swimming pool equipped with the latest timing system by Omega and the Anti Wave Starting Blocks. Fee: P220 for 4 hour use. + Sante Fitness Lab, one-stop shop that will include a strength and conditioning fitness facility, sports rehab areas, a dance studio, a spinning class area, bike shop and services, a nutrition and fitness café, VO2 max/lactate testing by using a machine that can test an individuals level of oxygen while training , plus conference and lecture rooms to be managed and operated by Sante Health & Fitness, Inc.
I’m honored to be one of 25 to be given the opportunity to share my story for Ayala Land’s 25th Anniversary with the theme “Generations Ahead” in which they celebrate 25 years of building communities that are innovative and increase value over time. In the coming weeks, they will be featuring 25 individuals who have grown with the company, created lasting memories, and made a difference in the country. The partnership between Nuvali and TBR Dream Marathon started in our inaugural event in 2010 and, by Dream Marathon 2014, it will be our 5th year of a wonderful partnership. Without the initial trust and support of Nuvali, most especially its General Manager Jun Bisnar who ran his first marathon in our inaugural race as well, we wouldn’t have been able to make all these marathon dreams come true. Thank you to Nuvali and Ayala Land for supporting us and our runners! This weekend, Ayala Land and R.O.X. 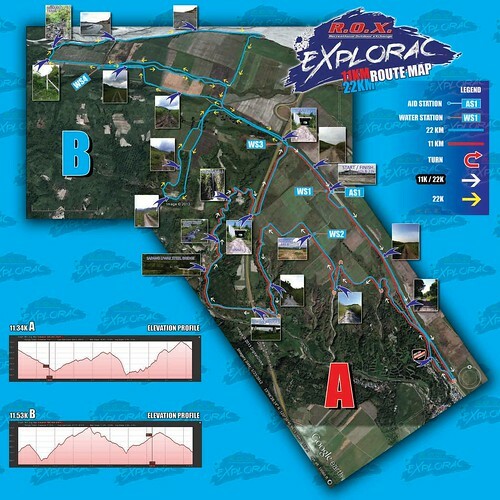 are staging the Explorac Trail Run in Porac, Pampanga. For now, sadly, it’s an invitational event only. Even sadder, I can’t make it, but my crayzee and super fast ultramarathoner friend, Reylynne dela Paz, will be our official Run-porter for this race and she’ll be taking photos and sharing her race experience by next week. (Stay tuned!) The good news is that there will definitely be more events in this new trail running venue, especially with such great companies to support it. I heard that the course has a flat to hilly terrain and majority of it is hard surface. The trail features wet/dry river bed, if not all, are heavily silted by mudflow due to Mt. Pinatubo’s eruption way back in 1991 and succeeding lahar flows. In some areas, a moderate steep climb will be experienced along the rough terrain portion and huge lahar track will potentially challenge a runner’s trail running skills. 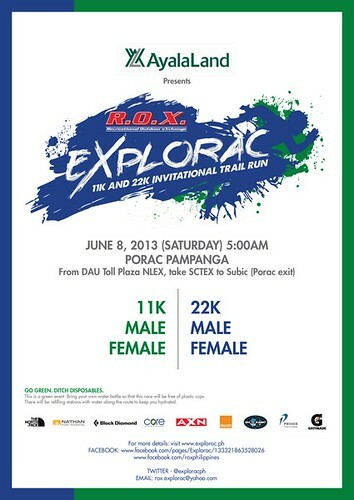 There will be opportunities to run under the SCTEX bridge and pass beside waterfalls. Woah. Sounds like a great adventure. I can’t wait for future events in Porac!